The firefight in the town was the last straw for many of the families, and so seven families including ours decided to evacuate to the island of Homonhon near the southern tip of Samar. Homonhon lies at the entrance to central Philippines from the Pacific and in school we were taught that Homonhon was where Magellan first landed in the Philippines in 1521. Our group actually ended up on Montoconan, a small, beautiful island off the northeastern tip of the main island. It was easy to feel safe on Montoconan; it was very remote; there were only a handful of families, no more than five, and there was nothing for either the military or the NPA to be interested in. 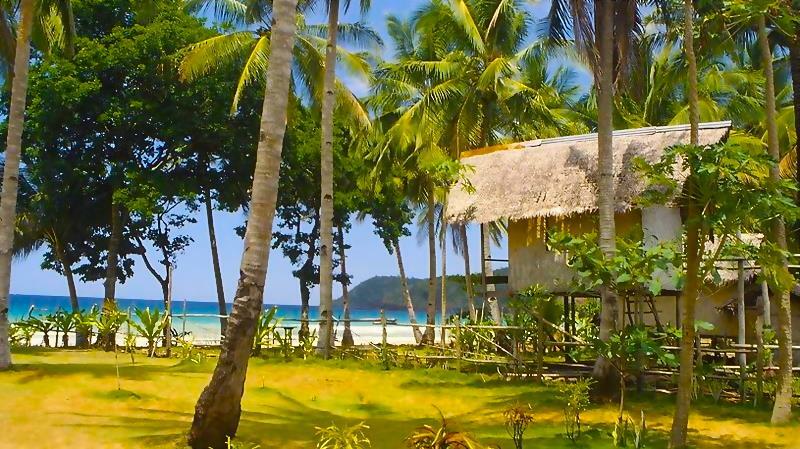 When our group arrived, we stayed for more than a month at a copra processing pantaw—a large thatch-roofed structure with open sides where the owners and workers dry the coconut and make it into copra, spreading it out on the floor and putting a fire underneath it. Eventually the local landowner, Tatang Bayu, agreed that we could build a more permanent structure, and so the men of the group built a longhouse, which was divided into five apartments. Then the group built a separate house for the head of the group, who was a Pentecostal minister. Our family was the only Catholic one of the group, which was Pentecostal, and perhaps for that reason my parents didn’t want to move into the longhouse. Instead, we stayed in the pantaw long after the other families left. My dad struck a deal to work for Tatang Bayu, the pantaw owner, by climbing to collect coconuts in return for being allowed to collect coconut leaves from the owner’s trees. He then used these and other local materials to build a house right by the water, which allowed us to finally move out of the pantaw and into a new native home. With the house built, we had permanent shelter but not a centavo of money. Montoconan is blessed with a large coral reef that extends hundreds of feet out into the ocean where, at low tide, you can walk among the corals and tide pools. We spent the days roaming the reefs, finding abundant shellfish including clams, crabs, other crustaceans, and even sea urchin which, I learned, is delicious to eat out of the shell but doesn’t travel well; you have to eat it on the spot. We also found ganga, a shellfish like a small conch, and dalu-dalu, a type of snail-like sea slug. We would try to collect more than enough for the family, so we could sell the excess and use the money to buy rice. When we couldn’t afford rice or when none was available, we asked local families for permission to pick rimas or breadfruit, which looked like jackfruit but didn’t taste very good and could only eaten if it was cooked. Rimas was abundant and was not normally considered a food for human consumption; it was usually fed to pigs. We ate a lot of rimas, and were grateful for it. Rommel and his friend Eddie would go to the north side of the island where you could see the mountain where our village lies, and sat on the rock, and they would talk about how much they would like to go back to Guinob-an. If they could only walk it, they would. But the sea kept them away from it. I spent half of each day in the water, and I loved it. I would have loved living on Montoconan except for the poisonous, stinging centipedes, which seemed to be everywhere around the house and inside the house. Everyone lived in a constant state of alertness for centipedes. My dad, who had to sleep outside on the porch because there wasn’t room inside, got bitten so many times that he developed immunity to the centipedes. Because of the centipedes it was important to keep the house without clutter, and dry, which was hard to accomplish in the tropical heat. The centipedes liked moisture, and would burrow inside piles of clothes. Every time a family member picked up any piece of clothing, it was important to shake it out and make sure that no centipedes were lurking inside. After a time, my sister Rowena got work as a household helper with one of the families on the island and earned a small salary plus a rice allowance, which she shared with the family. But it still left us with almost no cash, so eventually when the Heritage Mining Company opened a chromite mine on Homonhon that year, Tatay went to work in the mine—a job that allowed him to “advance” half a quintel of rice per week as a draw against his salary, which was barely enough to pay for the rice he drew for the family. But with Rowena working as a household helper, Tatay working the mines for rice, and Nanay and I collecting crustaceans, the family got by. The sea surrounding Homonhon was so abundant, the food was so plentiful; there were many more varieties of fish and many shell fish—such a big island with wide coral reefs. So, even though we were just visitors there, we really didn’t go hungry, because everyone in my family was able to find food, nature’s gift from the sea. Even now, when I think back to the time on Homonhon, I feel like it was special. I wasn’t concerned about the future; I was just enjoying the life. I was never really scared. I had fun. The beautiful water was right there, with tidal pools at low tide that contained all kinds of exciting creatures. My parents felt differently. We were visitors and they wanted to go back to home to Guinob-an. But I was happy; I enjoyed so much going out to get seashells; there was limitless food and beauty—and peace.When we arrived on Homonhon, my sister, Eva, was pregnant. So, when we would go out collecting shellfish along the beach and reef, Eva would stay and watch the two grandchildren. Six months after arriving on Homonhon, she had her baby, a month prematurely, delivered by Nanay. The fragile premature baby was a girl and we named her Ria. She was very small and very weak. To Nanay it was clear that little Ria would probably not survive. Over the previous few months, Nanay had gone back to Guinob-an several times. The situation was still tense, but Nanay said it was better than when we had left. My parents and older siblings began to talk about going back to Guinob-an. Nanay was deeply concerned that if Ria died on Homonhon we would have to bury her there and abandon her when we eventually went home; she was determined to not let this happen. And so eventually, after seven months on Homonhon, it was decided to go back to Guinob-an. Carrying the tiny Ria, who by then was very sick, we made the journey back to Guinob-an and moved back into our old house. Ria died a few weeks later. We were sad but not surprised. It was time to re-start our life in Guinob-an.